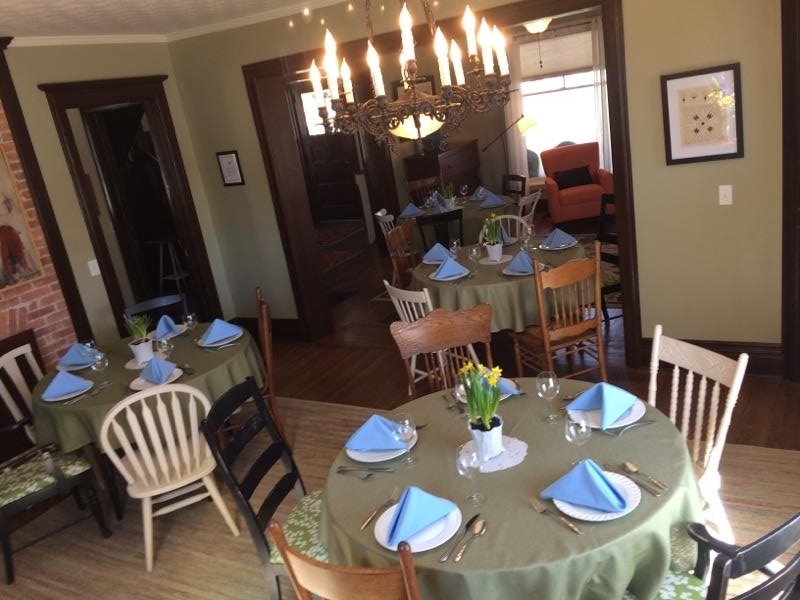 Our first floor dining room, front parlor, sitting room, kitchen and butler's pantry are available for your event. Our rates begin at $8.95 per person for an informal 3 hour gathering and $12.95 for a seated, more formal, 3 hour event. Hospitality staff are available for an additional hourly fee. The space is perfect for your catered event. In this space we can accommodate 30 people for a seated meal and up to 50 for a less formal gathering. The recently renovated 2nd floor space in the barn offers another possibility for your gathering. Rates for The Barn begin at $10.95 for an informal 3 hour gathering, and $14.95 for a more formal seated 3 hour event. Hospitality staff are available for an additional fee. The Barn’s maximum occupancy is 45 people. We provide all tableware and have a selection of table linens to choose from. Coffee and tea will be provided for your event. We have preferred caterers, choosing to support small local restaurants and catering companies, but you are welcome to contract with the caterer of your choice. The dining room and front parlor become our multi-purpose space - various table arrangements. Scroll through images. Our kitchen. The gas range has a 3 rack oven and 5 stove-top burners. Scroll through the photos above to view the complete space. The Front Parlor. This room can be cleared completely changing it to additional dining space. Scroll through the photos above to view the complete space. The front foyer. Our space for welcoming guests.. There is a coat rack, coat hooks and a coat closet easily accommodating all guest's outerwear. Scroll for additional images. Our side sitting room. Scroll through for additional images. The Inn did an outstanding job putting together a great night for our management team and their significant others. She handled all the catering and included a bartender. It was perfect. The convenience of the available overnight rooms helped with out of town guests.